Who doesn’t love the chirpy sound of birds greeting them with their morning cup of tea! If you have a backyard with trees, you know what we are talking about. At Jungle Bros Treescapes, we are all about the trees! And trees play host to a whole range of beautiful wildlife that enhance your backyard’s ecosystem. 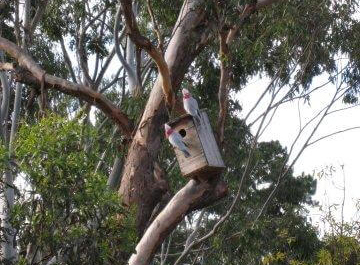 We not only offer tree management services, but also stock and supply birdboxes for the birds. Our experienced trees climbers can safely install these bird box habitats into suitable trees to create a welcoming environment in your backyard for the wildlife. Our birdbox installation service is priced from $55 (exclusive of the cost of BirdBox). If you are getting your tree work done from us, you get the installation service on the house! Jungle Bros Treescapes can also include cuttings into limbs whilst performing maintenance of prunes, encouraging a natural habitat to form over time.